Looking for Star Wars gift ideas for those that love to cook? 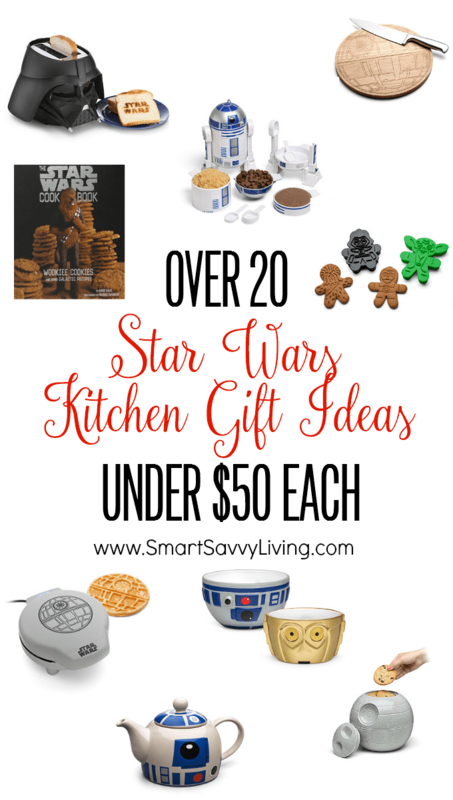 Our 20+ Star Wars Kitchen Gift Ideas has something for everyone at under $50 each! Okay, I have to admit something sad. I never saw any of the Star Wars movies until I was 23 when I first met Mr. Savvy. Yes, I know, I know. It was something I was never introduced to as a kid. But, I immediately loved all of them. We’re a bit corny and love all the various memorabilia. We even have our mantle full of various toys of our favorite movies and video games that you might think normal … if we had a few kids. While I do love the cuteness of the toys, since I love to cook, I also like the themed kitchen gadgets and other goodies. I know there are several others like me out there, so I thought I’d put together this list of over 20 Star Wars kitchen gift ideas under $50 each. You’ll find everything from cutting boards to waffle makers that die-hard Star Wars fans are sure to love being gifted for their birthday, the holidays, and any occasion in between. This post was last updated 4/23/2018. R2-D2’s head rotates up to 60 minutes with this super cute Star Wars kitchen timer. This is one of the coolest Star Wars gifts for adults that love coffee. This set is not only great for ice but also chocolates, candies, mini cakes and more since they are freezer, fridge, dishwasher, and oven safe. The family will love waffles even more when they look like the Death Star! Check out our Chocolate Death Star Waffles recipe and review of this Star Wars waffle maker. Dinner will never be boring again with this salt and pepper shaker set. Move over gingerbread men, gingerbread Chewbaccas are where it’s at. The dark side really does have cookies! I love that it makes a sound when someone opens it. 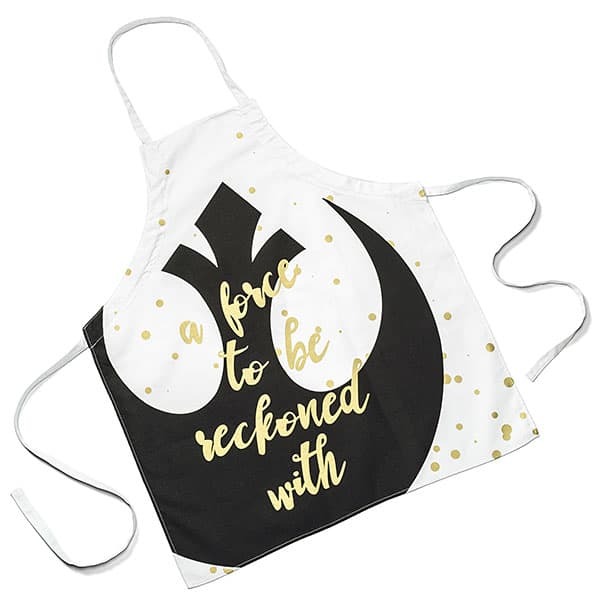 Keep your clothes looking nice while making food for your Star Wars party with this super cute apron. So cool that this pizza cutter even has sound effects! I know I never seem to have enough bowls. This wood cutting board is gorgeous! Nothing’s better than a hot cup of tea when it’s cold outside. 13. Darth Vader Apron – and lots of other characters, too! 18. Star Wars Stormtrooper Silicone Oven Mitt for $14.99. Okay, so this isn’t under $50, but I had to include it because I think it looks super cool… the Star Wars X-Wing Chrome Knife Block for $79.95. Really, the price isn’t bad at all since it comes with the knives, too. 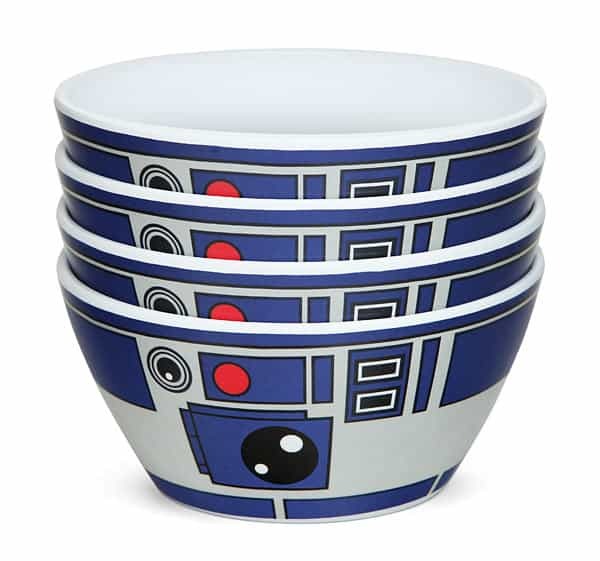 Have you seen any other Star Wars kitchen gift ideas that you’d love to have?